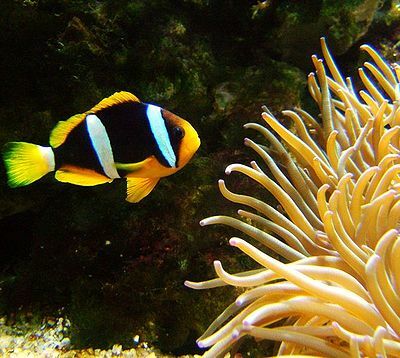 Clarke’s Anemonefish are also called Yellowtail clownfish and are extremely popular aquarium fish. 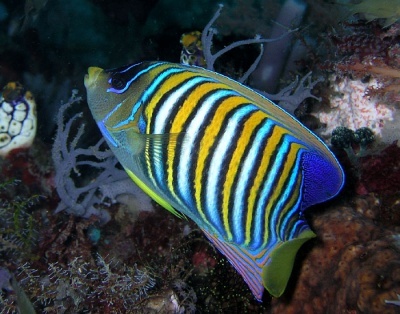 These fish have vivid black, white and yellow stripes, though the exact pattern shows considerable geographical variation. They are natively found in Indo-Pacific waters. Because they are bred in captivity, they are easy to find and reasonably priced. They are a perfect fish for a beginner. The males grow to 4 in., the females to 5 7/8 in. These fish are able to hold their own and will avoid more aggressive fish. They are robust fish and spend a lot of time out in the open. The minimum tank size 66 gal. In a reef tank, add an anemone host or other invertebrates. In a fish-only tank, rock structures are a good addition. They are omnivorous fish and will eat brine shrimp. They will also eat live foods, frozen and flake foods, algae, meaty foods and tablets. Feed about twice a day.